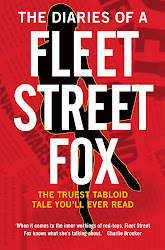 fleet street fox: Fox in a frock. THE papers are full of how amazing ex-model Christie Brinkley looks at the grand old age of 57. She does look great. But then if I had millions of dollars, never had to work and could afford a £1,000 Herve Leger dress with internal scaffolding I'd look pretty perky too. The first rule of journalism. It's time to put a ferret up them. Welcome to the Middle Ages. The Fox on BBC R4 Woman's Hour. Lawyers agree with The Fox shock. News has to be new, Hugh. Royal Wedding: the bland marrying the blah.